Watch this 3 minute video to see Joe in action. Aside for performing concerts, I love working with groups over a period of time, collaborating and creating together. I have worked and facilitated many groups at retreats, conferences, schools, juvenile detention centers, camps, museums and more… At the core of my facilitation is the belief that we are ALL powerful creative beings, we all have stories to tell, and that learning to become “cultural creatives” enriches our lives, our society, and our world. I believe the more multifacited our learning is, the more engaged we can be as citizens and live an artful life. There is no such thing as artists and non-artists. I don’t believe it. We all have the capacity to be cultural creative artists and givers, in our own way! I also know from experience that using visual art and music can be a powerful way to teach curriculum in the classroom. How do kids learn their ABC’s? they sing it! Songs about the Underground Railroad, The Holocaust, Slavery, and WWII can be effective and inspiring tools to learning history and storytelling. I am honored that my songs have been used by educators around the US as part of their teaching curriculum. ARE YOU interested in hosting a 2-3 residency or group experience at your middle school, high school or retreat? I know, there are many questions. Together, we can brainstorm and plan an approach that fits your needs. What is the flow of the day? What materials are needed? Process vs product~ The brainstorming and collaboration is part of the process. Every school, camp, or retreat is different. Joe has worked for years as a songleader, organizer and facilitator at 100’s of retreats, camps, schools, conferences, churches and workshops throughout the US. He clearly has the gift of creating and building community through song, movement, play and ritual. He is a sensitive and natural facilitator with a clear vision of inclusivity, creative empowerment, and creating a “WE” experience rather than a “ME” experience. 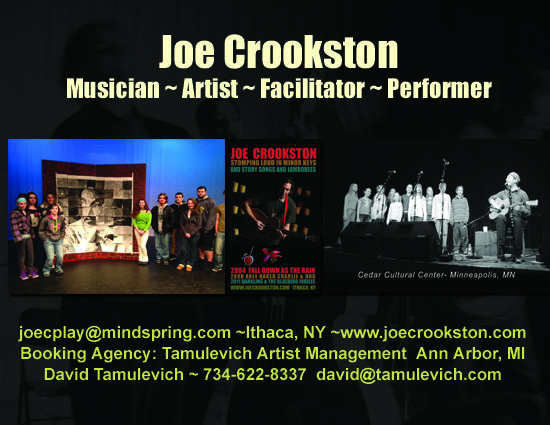 As an artist and group leader, Joe has worked with many organizations throughout the US, including The Cease Fire Foundation of WA, The Power of Hope, Pennsylvania Council for the Arts, The King County Juvenile Detention Center, and many others offering a space for teens and adults to discover their authentic voice through music,storytelling, creativity, and personal expression. He believes everyone has a powerful story inside, and he clearly has a unique way of bringing it out in others! Recently, Funded by The Cease Fire Foundation, Joe facilitated a year-long writing and recording project with detained youth at the King County Juvenile Detention Center in Seattle, Washington. The youth he worked with recorded 3 full length CD’s of original songs, spoken word, raps, and poems using a mobile recording unit set up in a 6×6 jail cell. With Power of Hope, Joe co-creates with, and facilitates teens from culturally diverse populations. He collaborates with other artists and youth workers in facilitating day, weekend and week long immersions into political, environmental, and creative exploration as a means for personal,and cultural change and empowerment. to inquire about program possibilities, rates and availability.